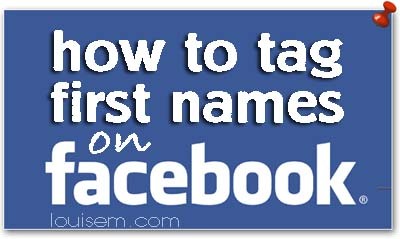 Give your friends Klout by learning how to tag first names on Facebook! Klout has added name tags on Facebook as an indication of influence, since men­tioning someone’s name in a post indi­cates an effort to engage with them directly. In a casual comment on Facebook, it’s a bit formal to tag your friends by their full name. You can easily delete a last name or first initial (or both) to tag a friend by the part of their name you’d normally use. Just start typing your friend’s name, beginning with a capital letter – the @ symbol isn’t necessary. Once you’ve typed 5 letters, a drop down will appear with tag suggestions. Just click on the one you want, and use the backspace or delete key to remove the last name. If a friend has more than two names, the tag can be shortened to any adjacent names. You can leave the first and middle name, or middle and last name, but you can’t remove just the middle name. 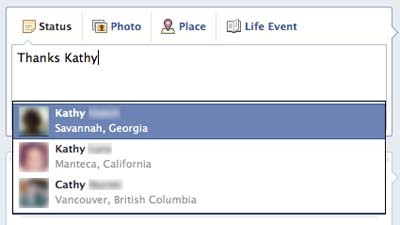 Only tags of friends can be shortened — tags of Pages, Events, Groups and other Facebook properties will become inactive if a you try to shorten them. Here’s a quick video to show you name tagging in action. Use of the @ symbol is no longer necessary.